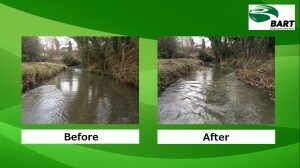 Bristol Avon Rivers Trust » Latest News » Uncategorized » Can you offer us ‘Bags of Help’? Can you offer us ‘Bags of Help’? BART are delighted to have been selected be a recipient of the Tesco Bags of Help initiative to continue our habitat enhancement works on the River Marden in Calne, Wiltshire! Tesco has teamed up with Groundwork to launch its Bags of Help initiative across England and Wales. The scheme will see three community groups and projects awarded grants of £12,000, £10,000 and £8,000 – all raised from the 5p bag charge. However much we receive is up to you – the voters – so if you like what we do, then please give us your vote! The more funds we receive, the more improvements we can make and the closer we can get to improving the whole of the Magnificent Marden for people and wildlife.